Think this hamburger joint resembles any other burger places? 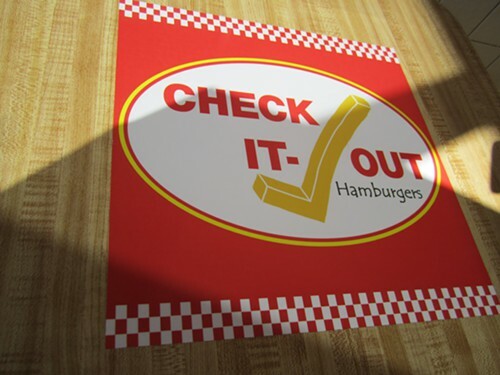 Maybe a national chain that uses the same color scheme, a similar logo and a name that sounds a lot like Check It Out? "Wow, it looks a lot like In-N-Out," I said to the girl working at this new burger place in the old Taco Shop Co. location at 45 W. Valencia Road. "Yeah, a lot of people have been telling us that," she said in a monotone voice that perfectly communicated her absolute disinterest in the subject. The fries are hand-cut, and they come with some sort of aioli that tastes great. The prices are also super low, and it was doing decent business yesterday afternoon. Frankly, I liked it better than In-N-Out, for what that's worth.